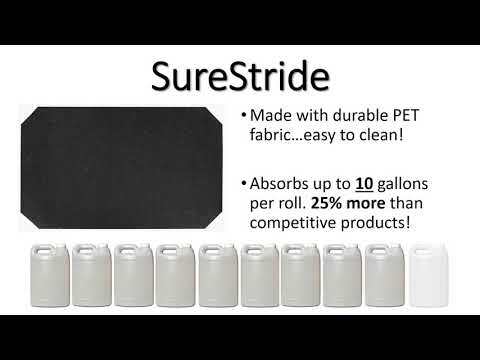 M + A Matting Sure Stride Mat - 3' x 100' | DAWNCHEM INC.
High traction mat surface provides safe walking surface. Certified High Traction by the National Floor Safety Institute. Cutting knife included. Cut individual mats as needed from roll. Taci Back adhesive system keeps mat flat and in place, even with cart and buggie traffic. Very low profile, reduces tripping hazard. Moisture barrier keeps liquid from soaking though to the floor. Mat constructed from durable PET fiber and is easy to clean. Will perform up to 3 months under normal use. Recommended for commercial use on hard floor surfaces to prevent slips, trips and falls caused by wet floors.